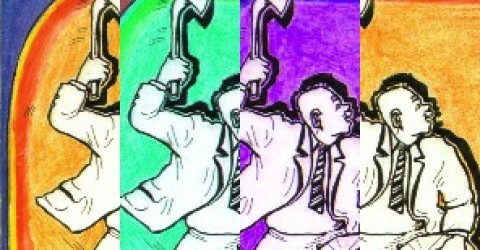 Uncategorized | Don't Beat a Drum with an Axe. Language is an important issue in evaluation I realised just before holidays during the presentations on the INTRAC conference on Monitoring and evaluation. Where one is developed from the root counting and the other from the word values … you can imagine that they also represent the two main lines in PM&E (Planning, monitoring and evaluation). The introduction of the director of the IOB (Dutch ministry of foreign affairs ‘Inspection for development cooperation’ – what’s in a name…) was completely pushing towards accountability: showing the need for thorough research into the impact of developmental interventions. Roughly speaking: the main aim is to find proof of results in developmental projects, in order to convince politicians to budget for international cooperation. That’s in itself a noble thing: without money there is a lot less possible. But although I consider it necessary, I think its not sufficient. And there we arrive at the values of evaluation: I think in the end it is more effective to go back to the roots of International Cooperation (and solidarity): somewhere after World War two it was an outcry of ordinary citizens in the richer countries (like The Netherlands) that they found it not compatible with their values to see large part of people in the (then Third) World succumbing to famine and suffering poverty in general. That led to the start of many a ‘development organisation’ like (Oxfam) Novib etc. where the public set aside some of their own wealth in order to show their practical solidarity with people living in poverty. I see evaluation as a process where we should go back to our joint values and have a look together whether we accomplished what we intended together (as joint stakeholders, first and foremost local people and organisations at the place where project or programmes are running). So there is no space for corruption, there is no space for negligence and inefficiency – no difference here with the accountability paradigm. The difference is in the way of assessment and what’s more in the goal of the assessment. In my view we should focus on a joint understanding of what has been reached and on a joint effort to reach more. Hence my interest in new forms of evaluation (see www.evaluation-5.net) and my constructivist methodological approach (see www.bwsupport.nl). The results are also different: of the accountability inspection the intended result is to convince politicians (if they can be convinced at all…), of the evaluation the intended result is to do it better together – both local and international stakeholders who negotiate about their joint goals. So there is a lot in words, thinking through the very intentions behind them…. Most of the time the ‘first generation’ (quantitative) information can be counted (in the upper left box) and should be counted as well! But this is not much more than what we use to describe as output! 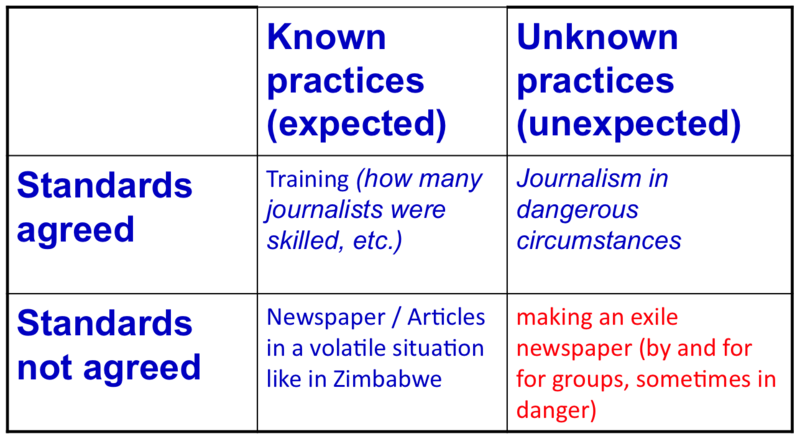 We need ‘Second generation’ information – qualitative , what are peoples ‘perceptions’ – for the upper right and lower-left box, in order to understand more about the outcome (what does the project do with people, what do e.g. trainees do with their acquired skills). Now we also need to know about the impact: what effect does the project have on the (Zimbabwean in this case) society? And then we are in dire straits, where a single tool cannot help us anymore: we will need a host of methods / methodologies to find out about it: how else can you measure something that is unknown as a practice and for which very few standards are developed? In my view the best way is using the ‘back of your brains’: putting all your knowledge and skills on the scale and start working on a tailor-made methodology. Many times in my case that will be fourth generation (see http://www.bwsupport.nl) or one of the many tools we are trying to develop in the fifth generation methodologies with a group of evaluators (see http://www.evaluation-5.net). That can include (parts of) Most significant change, Social return on investment, Developmental, Outcome mapping, logical framework, etc. 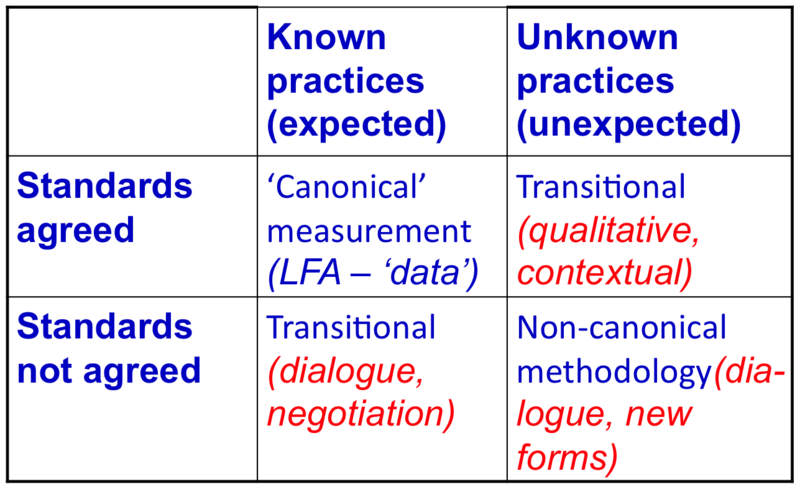 methodologies. But the way of operating is virtually always the same: count whatever can be counted – it is certainly necessary, but it is not enough. Personally I prefer qualitative methodology for outcome and a mix of co-creative, constructivist and iterative ways of ‘tackling impact’. #Twevaluation 2: How useful is Twitter? At the 1% Event on 17 september 2010, the twitterati sent tweets like: “Great energy #1pce” and “Good buzz @ #1pce”,’ Tiina Urm speaking #1pce, http://www.youtube.com/watch?v=A5GryIDl0qY”. Overall, Twitter is used to inform the followers on what is going on. The tool is great for short announcements, and for referring to Youtube movies and websites. Quick, in 140 characters (less if you leave space for re-tweeters), a message with an impression. Furthermore, thanks to the hashtag #, anyone can quickly see all the tweets about a specific subject. For monitoring purposes Twitter is a tool to assess the mood at an event. Are people mentioning what is happening? Which activities are they mentioning most? How are they mentioning the activity? What can Twitter add as an evaluation tool? Tweets need to be collected immediately after an event with the Twitter Search function and saved elsewhere; leave it for a few days and the majority of tweets has already disappeared. The tweets can then be counted, individual twitterati counted, mood assessed, and comments counted and analysed. We noticed that only a few tweets had some form of content that was useful for evaluation purposes, beyond very general announcements. Out of the 900 tweets only 96 had some form of content/mood that was useful. Furthermore, all comments tend to be positive, in line with Twitter culture. The questions that the twevaluators asked were seldom answered. Even personal replies with an additional question were not answered. Somehow, that does not go well with the medium. Consequently, the evaluation questions formulated for the day were not answered by Twitter. What worked well was the screen in the conference main hall. Everyone could see the tweets, and the re-tweets by the tweetdeck. That added to the mood of “It is happening now!” and it added to the inclusion of all participants. During the day, we became aware that lots of participants never twittered, and did not have an account. One even twittered afterwards that he did not dare to use his old fashioned telephone in such a hip environment! We may need more visuals for the ongoing outcome of the tweets real time, for example a time line with the best activities or a top 10 on the screens that evokes more evaluative tweets; this might encourage more participants’ involvement. Black slaves, black coffee, black oil: Angolan – Dutch relationships over 4 centuries. Of course you all know that Luanda was occupied by the Dutch between 1641 and 1648. That was when ships of the West and the East Indian Company sought to overtake Portuguese dominance in the Angolan slave trade. Mutual interest to ‘rule out and destroy’ the Portuguese resulted in a treaty with the re-known Angolan queen Rainha Ginga. The queen would hand over half of the slaves she made to the Dutch. In return the Dutch would support the queen against the Portuguese. Towards the end of 1648 the Portuguese forced the Dutch out of Angola, but the slave trade had flourished for all those years and would flourish for a long time still… After the Dutch colony Indonesia gained independence the Dutch moved to Angola for their coffee. Prior to the liberation war Angola was one of the worlds’ main coffee producers and the Netherlands was one of the main buyers of Angolan coffee. The Dutch Angola Committee (later Holland Committee on Southern Africa and NiZA) put pressure on major Dutch coffee roasters and distributors to stop selling coffee from Angola. Albert Heijn and Douwe Egberts were so afraid that they stopped imports even before the campaign had been publicly launched. This coffee boycott became a textbook example of how a small group of civil activists can achieve results with amazing speed… The third wave of Dutch – Angolan trade in a black commodity is going on to date: oil. In 2008 Angola’s export income is said to be $67 billion and $60 billion comes from oil. The value of Dutch oil-import has risen from 57 million euro in 2005 to almost 1,2 billion euro in 2008. No wonder that Dutch ambassadors openly stated that ‘energy security’ is the Dutch department of Foreign Affairs’ first priority. During the first 30 years after liberation Dutch policy focused predominantly on providing humanitarian aid to the war torn population. Besides some modest support in the areas of human rights and good governance, the bilateral aid has now virtually dried up: The amounts provided went down from 12 million euro in 2002 to a last input of 2,5 million euro in 2005. Meanwhile the bilateral focus of the Dutch Government has shifted in Angola from aid (back) to trade and several facilities have been developed to promote this. The Dutch interest in Angolan oil and Liquefied Natural Gas (LNG) and the Angolan interest in Dutch “know how” and the technological expertise to cultivate and transport these are key factors for an advantageous mutual cooperation. Also the Dutch tradition in maritime transports and in the management of ports is of great interest for Angola. For example Dutch company Heerema Maritime has just finished the construction of a shipyard in Porto Amboim (Kwanza Sul) This shipyard is now providing assistance to Angola’s offshore oil and gas industry; Royal Boskalis has been awarded a contract for the dredging of the Soyo Liquefied Natural Gas port in North Angola…. In the meantime Angola has also moved up in the ranks of Dutch export and is currently the second largest market for Dutch (mainly consumer) products in Africa, after South Africa. For the past years the Dutch Embassy published a newsletter focusing on business opportunities in Angola. The title is ‘Time is now!’ But looking closely at the Netherlands – Angolan trade ties over the past centuries it may be clear that there is no such thing as ‘Time is now!’ For centuries the Netherlands got a very good deal out of its linkages with Angola. From the treaty with Rainha Ginga to the deals struck by the 2009 Dutch trade mission headed by the Dutch Minister of Economic Affairs. Finally: what does the (re-)structuring of the relationships between Angolan and Dutch government ‘from aid to trade’ mean for Civil Society here and there? David Sogge and I wrote about it it in the book ‘Southern Africa: Civil Society, politics and donor strategies’: We conclude that the civil domain in today’s Angola is highly constrained. Government is not accountable to its citizens: their income comes from offshore. Dambisa Moyo descibes this in ‘Dead Aid’ as the reversed Boston tea-party: no representation without taxation… We therefore argue that international development agencies, currently fixated on project-based development strategies, should put much greater priority on enlarging and protecting public domains expanding the ‘public arena’ and making it transparent. Popular leverage and a shift in the balance of forces in the arena is important, but a viable objective in the middle run would be to enhance responsiveness of the Angolan state to citizens’ needs, e.g. by supporting social movements to become strong enough to hold the government accountable, thus setting precedents for wider formal democracy in the longer run. Thus focusing on the direct contribution of Dutch civil society to the strengthening of Angolan civil society. May be this in the end could historically seen also become a continuum… like the trade relations between both countries…. Margreet van der Pijl of the 1% club wrote in her blog Quality improvement through Crowd involvement how the 1% club is looking for new ways of evaluation. Gisela Dütting (http://giseladutting.wordpress.com) and I took up the challenge and decided to start with the 1% event last friday, 17 September. We counted on the many ‘twitterati’ in the crowd and started formulating questions to be asked during the day. We also directed questions to people who had for instance indicated that they liked a specific presentation or open space workshop (e.g. ‘what did you like specifically’): all together during the day: 4 answers (as many as we got on one general question, more or less a ‘control’ question about the quality of the lunch…). The 900 tweets could after the event be retrieved and analyzed – there were 96 tweets that contained enough content to make analysis possible. The fact that 900 tweets were produced on 1 event (which made the event the 5th largest event on Twitter in Holland that day) is in itself significant for instance. But also the emphasis on the good feeling during the meeting and the enormous amount of positive energy during the day speaks to the imagination. Tiina Urms presentation on cleaning up the WHOLE of Estonia in one day (onepercentblog.com/tag/tiina-urm/) was by far the most popular presentation for the twitterati. But twitter as a tool? We really need to improve it for next time – if it is at all possible to use it for monitoring of an event…. (‘instant crowd sourcing’)?